Background: Although born into the noble family of Soare, Auvre certainly didn't live the life of prosperity one imagines. His mother had passed away early in his life, while his hopelessly romantic father quickly married a selfish, greedy gypsy by the name of Tiganja. All luxuries and fancies were available at the snap of a finger for Auvre---except the love and trust of his own family. 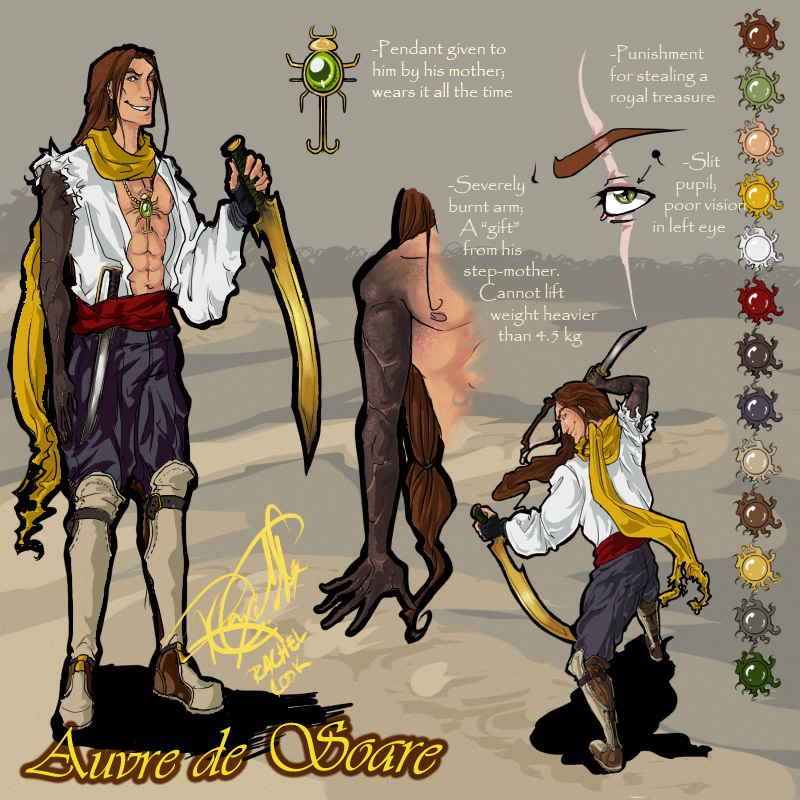 Despite being a rather spoiled rotten child, Auvre still tried is best to win the love and affections of his father, while keeping a keen eye on his avaricious new mother. When he turned sixteen, he was outraged to find out that his step-mother had received deed to all his father's riches and how deliciously foolish Ciaj was to throw around his treasures for the sake of his infratuations. After Tiganja admitted to only having commitment to her husband for the sake of fortune and not for love, Auvre snatched the contract from her grasp, and threw it into the fireplace. His own step-mother then called for the family guard to burn his arm as punishment for destroying her deed. To add to his misfortunes, Ciaj did not believe that Tiganja was responsible for his injuries, as the feeling of cold betrayal lead him to believe that he was not loved or even wanted by his own family, causing him to run away from home---that is, after stealing some of Tiganjya's beloved golden artifacts as well as carrying his deceased mother's pendant around his neck. He now lives in The Desert City of Void as a treasure and bounty hunter---even a thief if he must---,with the conclusion that money could really buy all the happiness in life---that happiness, for him, being solid with the awesome lustre of gold. Personality: Acts like a spoiled child, throwing violent paroxysms when things don't happen the way he sees fit. A bit selfish, and usually disregards the feelings of others unless they are in dire dependency. Uninterested in sexual conduct. Addicted to gold and its color, but starting to become fond of the bloody hue of crimson as well. Has the habit of stroking anyone's hair that resembles a golden blonde. Hates cold weather, young children, and silver; fears most insects---even harmless ones.